Young Oon Kim was professor of New Testament and comparative religions in Ehwa Women's University in Seoul, Korea. She was educated at the University of Toronto and later studied at the University of Oregon in order to further her understanding of America and its people. In 1954 she saw the truth of the Divine Principle, a powerful message revealed by God to Sun Myung Moon. And she went to America, as a missionary 1959 and introduced the Divine Principle to the English speaking World. This is an historical confrontation. Ever since I left Canada I have cherished my experience here with fond memories and drawn from these rich experiences throughout later years. When I heard of the group which I am now in, I spoke to Dr. Helen. Kim; she trusted me enough to ask me to go and investigate the group. After a week's investigation I brought my report to her. She reacted favorably and wished to know more about this group. However, later she was influenced by someone else and changed her mind. She then asked me to reject that group or to resign from the University. I told her that I could not deny the truth of God, therefore I would leave the University. When she saw that I was adamant she expressed her sadness at my leaving. I know that it was not Dr. Kim alone, but Elder Struthers and other Canadian Missionaries who had trusted me as well as the Women's Missionary Society and Training School who were also very sad and upset at my leaving and my heart was broken at not being understood, yet there was no way of explaining it at that time. I had to wait for the day when these things could be made clear although that day is still in the future. Our group is called the Unification Church or Unified Family and our teaching is called the Divine Principle. In the fall of 1968 Dr. Won Lyong Kang invited our group of ministers and theologians of the Methodist and Presbyterian Church at the Academy House in Seoul. Both Dr. Chae Jun Kim and Hyon Sul Hong were present. At the end of the presentation of the Divine Principle Dr. Kang stated that it is a great mistake in this ecumenical era to condemn simply newly rising religions group as heresy from narrow minded prejudice. Both Dr. C. J. Kim and H. S. Hong were grateful to have an opportunity to open dialogue between the existing churches and this new group. As a project of this group, professor Nam Dong Su of Yun Se University studied the Principle in its entirety in order to present it to this same group in the fall of 1969. In an Assembly of several hundred-a mixture of theologians, seminarians, ministers and laymen of major denominations in Korea Mr. Su presented the Principle in detail along with his criticism. He stated that the Divine Principle is a vast system of theology which is a great contribution to world Christianity. He went on to say that this Principle clarifies many points of Christianity and the Bible which had never been clear before, and gives a new vision to a stagnant Christianity. Thus our movement is not only recognized by the major Christian churches as worth studying as well as other groups. Our group is recognized as the most dynamic religious group by the Korean government because of its contribution as a group as well as that of individual members for their social action within the community. Two of our members received, at different times, golden medal from President C. H. Park of Korea for outstanding service. However, the most outstanding contribution is our Anti-Communist movement, which our group in Korea is carrying on in cooperation with the government. This Anti-communist movement is an example of an application of the Principle to one of the major social problems facing our country, and our group is now making a strong impact on Korean society. 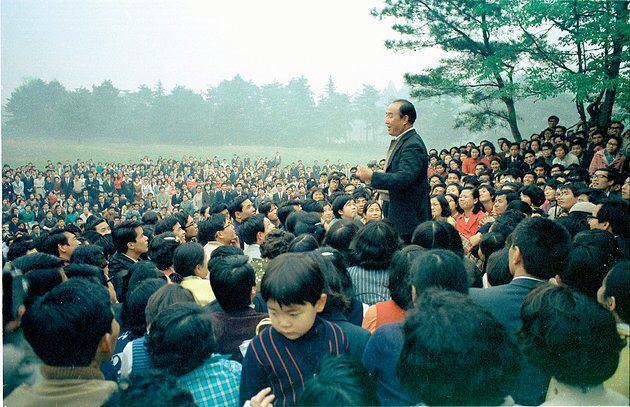 Our movement was founded by Mr. Sun Myung Moon who was called by God and given a special revelation. The Divine Principle is based on this revelation. Our group was organized in Korea in May of 1954 and I joined the group at the end of that year. I studied with Mr. Moon directly and taught the Principle in Korea until the end of 1958. I felt a mission towards the western world and came to the States in the early part of 1959. I enrolled in the University of Oregon and studied a year and one term. I took subjects which would help me understand American people and their way of thinking. While a full-time student, my spare time was spent retranslating the Principle into English. During the weekends I visited different groups and individuals who were seeking deeper meaning in life. I taught them the Principle and shared my experiences. Thus I started finding people. Eugene was such a small conservative town that I found it inconvenient to even publish my book. Therefore, at the end of 1960 I moved to San Francisco, a cosmopolitan city. Five dedicated young people followed me. There I legally registered our group in the State of California for tax exemption and legal protection. Our members increased and went out to open new centers in Berkeley, Oakland, Sacramento, San Jose, Los Angeles, and Fresno. I also found people from different nationalities from Europe. After they understood the message fully they wanted to go back to their own countries to start the work there. Thus our mission expanded to Amsterdam, Holland and Frankfurt, Germany. In 1964 I returned to Korea and spent nearly a year. During that time I visited Dr. Helen Kim, to her surprise, at Ehwa Women's University and told her what I had been doing. I returned to the States in January 1965 and went to England in April and started a mission there. I came across diverse individuals and groups in London, Birmingham. St. Anne's and other cities and taught them the Principle and also visited the European countries. I also visited Palestine and other countries in Asia on the way and returned by way of Japan. At the end of 1965 I moved the U.S. Headquarters to Washington, D.C. and have been operating from Washington since that time. We now have Divine Principle centers in 30 cities in 20 states in America and centers in Canada and Brazil as well as 16 countries in Europe and the Near East. Our movement started in Japan about the same time as in America and we now have a large group there. I make itinerary trips from time to time throughout the States and Europe. This is roughly the history and state of development of our movement at present. I am now going into the content of the Principle. How does it differ from the teachings of Christianity? In Christianity you emphasize the message of the New Testament with the view that Jesus fulfilled the Old Testament and brought a new revelation. The Divine Principle believes that the New Testament is now fulfilled with the beginning of God's new dispensation. Therefore the Old Testament dispensation is like the root of a tree and the New Testament dispensation under Jesus is like its trunk and branches and this final dispensation is like the fruit of a tree. These three stages of Old Testament, New Testament, and this New Age are interrelated each being dependent of the former stage. Thus God's dispensation has progressed. How does the New Age differ from the previous ages? In the Old Testament Age God carried on His dispensation through Mosaic Law which was Judaism. In that age man could rise to the status of servants of God. In the New Testament Age God carried on His dispensation through His son, Jesus, who was to subjugate Satan and to establish the Kingdom of God on earth. Jesus was rejected and crucified by his people before he could fulfill his mission completely. Thus the Kingdom of Heaven was not established. However, Jesus was able to raise man's spiritual status to the level of Paradise which is only a transitional stage to the highest level God wants man to achieve. It was really not Jesus' fault but the chosen people did not cooperate in his mission. Thus Jesus promised towards the end of his life that the Son of man must come again. If Jesus had completely fulfilled his mission then the Son of Man wouldn't need to come again. Because of the incompletion of his mission Jesus raised his followers only to the status of adopted sons and daughters of God which is much higher than the status of servant in the Old Testament Age. We use the word restoration in place of salvation. God, the Father, is not satisfied to restore man only to the status of servant or even adopted children. The Father wants to restore man completely to status of true sons and daughters, because he had created the first man and woman to be His real son and daughter. Until this ideal is completely fulfilled God, the Creator, cannot be satisfied. In this new status then how does the relationship of God and man differ from the previous stage. God is no longer an impersonal, distant, holy, mysterious and abstract being, but He is a very close and very personal Father of heart and dwells in man and with man and communicated with man from heart to heart. Therefore, once you are restored through a Savior-Mediator you come under the direct reign of God and no longer need a Mediator. Therefore, the New Age is the age of Father's direct reign both in the spiritual and the physical realms which is much more powerful and spiritual than previously. Therefore there is a relationship of give and take between God and man. Only through this give and take relationship of love can God and man feet great energy and joy. God created man to be an object for this give and take of love. Therefore God needs man and man needs God. The closer this relationship the more dynamic it becomes. To have such a close relationship with man was God's purpose in creating man. Therefore we emphasize Father more than the Mediator. However, there is a big obstacle between God and man to restore their close relationship of give and take which we call Original Sin. Original Sin sounds very fundamental. There are- two kinds of sin, one is personal sin the other is Original Sin. Sin means a state or an act of being separated from God. Personal sins can separate us from God but we can correct these by ourselves. But Original Sin is somewhat complicated. Because the first man and woman separated themselves by betraying God they alienated themselves and all of their posterity from God. We are the descendants of this original alienation. This is what we mean by Original Sin. The first ones who alienated themselves from God were Adam and Eve. Jesus came as the second Adam to restore that which the first Adam lost. Since Adam was a man, Jesus had to be a man in order to fulfill his work. In the alienation of the first man and woman from God, the angelic world was involved. In other words the archangel, Lucifer, violated the divine law and caused Adam and Eve to also violate God's command resulting in their separation from God. Thus Lucifer became the founder of the Satanic Kingdom. To fulfill his mission Jesus had to subjugate Satan and overthrow his kingdom. Until this is done Jesus could not establish the Kingdom of God. If this had been done by Jesus in his time, the end of the world could have come then. By the end of the world we mean the end of an age, therefore the end of the Old Testament age. If Jesus had brought about the end of the Old Testament age, he could have fulfilled the role of judge. Judgment means separation of good and evil. Since all these things were not fulfilled by Jesus in his lifetime the Son of Man must come again. This is why the Second Advent must be fulfilled to accomplish what Jesus left unfulfilled -- that is the complete subjugation of Satan and the realization of the Kingdom of Heaven on earth. The dispensation of the Second Advent will not be carried out by Jesus of Nazareth but by another Son of Man, whom God will choose. While the Jewish people were expecting Elijah to return Jesus said that John the Baptist was Elijah. John was not Elijah, but Jesus regarded him as the returned Elijah because John was completing the mission of Elijah. In the same manner the dispensation of the Second Advent will be fulfilled. We believe that Mr. Moon was chosen for the dispensation of the Second Advent in order to complete the mission of Jesus. When he completely fulfills his mission which still has a very long way to go, not only will Jesus' mission be fulfilled but also God's ideal of creation. At that time the spirit world and the physical world, which have been separated because of man's fall, will be united and come under the direct dominion of God. Also all Christian denominations and other religions will be united just as many rivers unite in coming into one ocean. The fulfillment of the dispensation of the Second Advent will bring about the union of God and man, and the spiritual world and the physical world. Therefore we will see an entirely new world. Today, however, we are living in a transitional period between this old and new world. The unique aspect of our movement is the cooperation we receive from the spirit world. Today many spirits, both good and evil are descending from the spirit world to intervene in people's lives. Evil spirits are disturbing people emotionally and physically but good spirits are helping people by guiding them towards a spiritual light. We see diverse spiritual phenomena around us. Some members in our group have direct communication with Jesus and God, Himself: These occur frequently -- and thus we receive approval from God and Jesus with regard to the validity of Mr. Moon's mission and the Divine Principle. I have seen countless numbers of men and women understand the Principle and accept it with the cooperation of the spirit world. Thus they have found a direction and meaning in life and become completely new people dedicated to God. I am most grateful that Father has used me to restore countless numbers of people to Him. So I have done literally and substantially missionary work teaching His truth during the past 16 years.